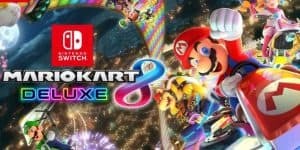 Mario Kart 8 Outshines All Others For The Switch and Wii U | Nerd Much? The multiplayer game for the Nintendo Switch we’ve all been waiting for, Mario Kart 8 is set to release April 28 and is up for pre-order now for $59.99. It will also be available for the Wii U, and there’s no catch so far. The Wii U version will still receive all the DLCs and extra content that the Switch version will get. Mario Kart 8 will also debut with the Joy-Con wheel accessory for $14.99 for a set of two. Multiplayer Modes: The multiplayer options in Mario Kart 8 Deluxe are as plentiful and diverse as the colors in Rainbow Road. Traditional split-screen returns with up to four players… In addition, races can be played online or hosted in LAN multiplayer sessions with up to 12 players (additional games and systems are required). Two players can even share one Nintendo Switch system when experiencing LAN play. What do you think of these brand new features? Will you be purchasing that Joy-Con wheel? Let us know in the comments below!